Amidst the flurry of standards heard each December, it’s always a treat when an artist gifts us with a collection of original tunes celebrating the holidays. 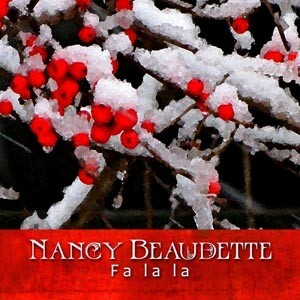 Singer-Songwriter Nancy Beaudette, who hails from Cornwall, Ontario but also plays regularly in Massachusetts, has done just that with her self-penned Fa La La. Beaudette brings her homespun charm to this nine-song collection weaving her folk, country, and singer-songwriter sensibilities around these tales, which are both personal and festive, and work beautifully with her smoky voice. It’s unlikely you’ll hear a more intimate set of holiday tunes released this year. The album opens with the effervescent title track, where the gentle strum of an acoustic guitar pairs beautifully with vibrant ribbons of mandolin. “Fa La La” is an infectious sing-along accented with everyone’s favorite traditions – getting a tree, hanging stockings, baking cookies, wrapping gifts, wishing for snow, etc. “Most of All Baby (I Want You)” follows a similar theme both sonically and lyrically, with Beaudette singing a love song to her man, the only gift she wants this year. The majority of Fa La La retains that substance and the record benefits greatly as a result. The holiday season brings with it a wide array of emotions and Beaudette captures them beautifully. “Silence Tonight” stunningly portrays war-torn families and the effect it has on mothers, always praying for their son’s protection. It’s a perspective I’ve found is often ignored in war themed material, so I’m glad to see Beaudette rectify that here with such wonderful results. Even better are “In Our Home,” a reflection on family and “Silvertone Guitar,” which chronicles her musical journey with the guitar that started it all. “In Our Home” is wonderful, overflowing with personal details from the Christmases of Beaudette’s childhood framed with the hook, “the most perfect yuletide story that I know, was in our home.” She approaches the lovely “Silvertone Guitar” much the same way; only it’s her musical journey taking center stage. There’ve been myriads of guitar tribute songs over the years, but they’re rarely packed with this much insight into the singer’s life. They’re my two favorite songs on the album because of the amount of detail she brought to the lyrics. Fa La La is a treasure to have this and every holiday season to come. Beaudette slyly starts the album on a lighter note, thinking your in for a much different collection then you get, a smart move, because it makes you appreciate the deeper moments that much more. While I love the production and lyrical content, I’m most enthralled with Beaudette’s voice, a treasure that sounds like it was born to sing Christmas music. If you’re a fan of holiday music (and lets face it, who isn’t?) then I highly recommend you pick up a copy of Fa La La. You won’t be disappointed. I became a fan of Heidi Feek after her profile during a season one episode of The Joey + Rory Show. During the segment, she introduced the world to her then fiancé and spoke about her love of listening to vinyl records. She’s since become a regular fixture on her parents’ television show, providing background vocals during performances and singing Patsy Cline’s “Walking After Midnight” and Hank Williams’ “Kaw-Lija” during Crosley Radio Vinyl Rewind pieces. Like her parents Feek is a throwback to a simpler era making it easy to forget she’s in her mid-twenties, around my age. She’s a great vocalist, with a distinctively bluesy twang not far removed from Cline or torch singer Mandy Barnett. I’ve been anticipating a full-length album since that initial appearance, and while I didn’t buy her 2010 EP Eden I was quick to acquire a copy of The Only when the release was announced in late August. Needless to say, I’m not disappointed. Feek’s first full-length album is a wonderful showcase for her distinct stylings and a fine introduction to who she is as an artist. The album blasts off with the rockin’ “I Like The Way,” an excellent electric guitar drenched number reminiscent of Dwight Yoakam, and the first of four tracks she penned solely with her father Rory. Reverb heavy “I Didn’t Know About You” (co-written by Feek, her father, and James Slater) continues in a similar uptempo vein, transporting Feek back to the Sun Records era of the 1950s while also updating that sound to keep the track modern and fresh. Similarly to “I Like The Way,” “I Don’t Know About You” succeeds on its electric guitar centric sound, giving Feek some muscle behind her energetic vocal. “57 Bel Air,” another father daughter co-write, is not only the best of the uptempo numbers, and the strongest track on the whole project and the one song I can’t wait to hear each time I listen to the album. It picks up on the electric guitar heavy sound that threads together the uptempo numbers, but adds a distinctive drum beat that elevates the track above the rest. “57 Bel Air,” in which Feek compares her current relationship to the classic car, does the best job of maintaining the rock sound Feek loves while also keeping the track firmly within the realms of her country roots. As a fan of Feek I was excited to hear her trademark ballads, the side of her musical personality I was most familiar with going in. Feek’s style is best summed up when she’s inspired by Cline, as she shows on “One Night With You,” a co-write with her dad, Austin Manual, and Aaron Carnahan and “There Lives A Fool,” which her dad co-wrote with Sara Evans about sixteen years ago. Both numbers are ripe with bluesy elements that allow Feek to shine vocally, although a chaotic guitar solo suffocates the end of “One Night With You.” The gorgeously understated opening of “There Lives A Fool,” featuring Feek’s vocal backed solely by an upright bass, showcases her impressive range and is one of album’s standout moments. I also really enjoy “Someday Somebody,” the album’s first single and a co-write between Feek and her dad. The song takes a modern approach to her bluesy side with distinctive electric guitar riffs infused with a steady drumbeat framing her straightforward vocal. Even more contemporary is the title track (which Feek penned solo), a 90s country inspired ballad about a woman telling her man he isn’t the end of the line in terms of relationships. I love how the drums and guitars work together to create a gentle ease that helps guide the song along. “Berlin,” co-written by Feek, her dad, and Slater, follows the same path although it’s far more addicting with the wonderful ‘we hold on/we let go/body and soul/still I love you’ refrain keeping it memorable. By all accounts, The Only is a solid album, although it didn’t provide the listening experience I was hoping for despite some truly outstanding numbers. There aren’t any clunkers on the project (not even a very atypical cover of “Heartbreak Hotel” that shows off Feek’s interpretation skills) but the production is too heavy handed at times, giving the album a sense of sameness that grows tiring after hearing just a few tracks. But The Only isn’t a bad album by any means, and well worth checking out.